“I was born in Switzerland and grew up on my grandparents farm in Northern Italy. My home was cold snow capped mountains and deep old forests. Living on the land, gave me a deep passion and connection to nature, following her rhythms, learning to look after animals, growing fruits and vegetables and learning my grandmothers way of using herbs to heal...... When I arrived in Australia everything was different, everything was new. I learnt a new language, new foods, a new culture and connected to a completely different landscape, the endless summer and the powerful healing powers of the ocean. In her early 20's, Claudia moved to Cape Tribulation in Far North Queensland, the only place in the world where the rainforest meets the ocean. At this time she discovered yoga and it was again an experience of arriving at a completely new landscape...except this new landscape she was exploring was inside herself.The journey of exploring the richness of the inner landscape is the aspect of yoga that Claudia loves the best and it is this experience that she endeavours to impart on students. Claudia had no intention of teaching yoga when she undertook her fist teacher training, she simply wanted to know more, to quench the deep thirst of her soul for the guidance in the journey of awakening. Now with over 700 hours of training, she has given herself to yoga completely. 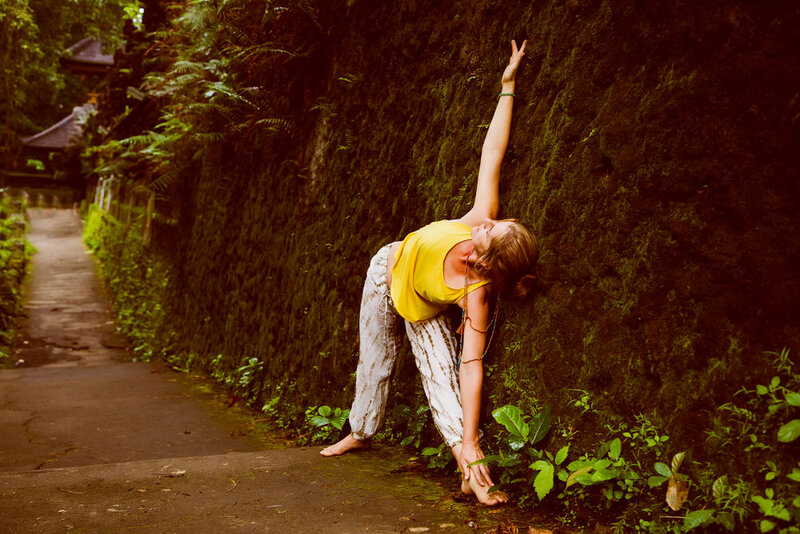 Her passion is in moving students away from simply doing a pose and guiding them to a deeper experience of what it means to allow the pose to become them. Her skill is in helping students understand the process that is yoga, to help them deepen their awareness so that they remain present for each breath, for each movement and for each sensation. In this way she is able to initiate students into the transformative power of yoga, to understand yoga as the process of purification of the many many layers of our body-mind so that we come back to who we really are without the imprinting, the conditioning, without the stories and dramas. Her teachings have been influenced by Akash and Adam Bornstein who ignited in her a curiosity for the ancient teachings of yoga and how they apply to our modern lives. Her fluid style of asana, attention to detail and deep inner listening have been refined under the guidance of Meghan Currie. Claudia continues to connect with Meghan on a regular basis as she always wants to be a student of yoga and to always be open to learning more. Claudia's deepest awakening has been through her work with Lynette Fox, a mentor and teacher that continues to inspire and support her journey as she wades through the deep waters of her psyche. When not teaching Claudia can be found with her on bushland property. With her family she has spent years regenerating this piece of land creating a sanctuary for all living beings. The journey here it to grow to a lifestyle of self-sufficiency and sustainability in the middle of the city.